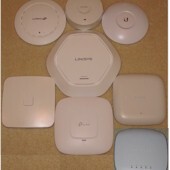 Discussion in 'NETGEAR AX Wireless' started by thiggins, Mar 19, 2019. If you have a spare $600 lying around and want to jump into the swirling waters that are today's draft 11ax/Wi-Fi 6 router market, you might be interested in NETGEAR's new Tri-Band draft 11ax router. 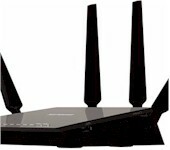 The Nighthawk RAX200 Tri-Band AX12 12-Stream Wi-Fi 6 Router joins ASUS's "AX1100" class ROG Rapture GT-AX11000 in the Wi-Fi 6 three-radio router rodeo. 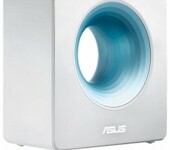 But the RAX200's $600 price point is $150 higher than ASUS's current $450 for the GT-AX1100. Both are based on Broadcom's draft 11ax platform, with three four-stream draft 802.11ax radios supporting maximum link rates of 1.2 Gbps in 2.4 GHz and 4.8 Gbps on each 5 GHz radio. The heart of the RAX200 is a 64 bit quad-core processor running at 1.8 GHz backed by 1 GB of DDR3 RAM and 512 MB of flash. Port complement includes five Gigabit and one 2.5/1 Gbps "Multi-Gig" port. 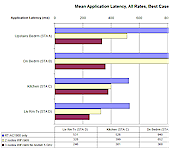 The 2.5/1 Gbps port is tied to the LAN side, but the single Gigabit WAN port can be aggregated with one of the LAN ports to boost WAN throughput for those with DOCSIS modems that also support aggregated connection. Two other LAN ports can also be aggregated. There are also two USB 3.0 ports that support storage sharing via NETGEAR's READYSHARE. NETGEAR is touting two ways to improve bandwidth utilization for multiple devices. The RAX200 spec sheet says up to four 2x2 devices can share a data frame via MU-MIMO or 8 devices can share airtime using OFDMA. Of course, your devices must also support MU-MIMO, which some 11ac (Wi-Fi 5) devices now do. But OFDMA support requires draft 11ax devices, which are also available in the form of Samsung's Galaxy 10 phones. But OFDMA support is having a rough birthing process and is not yet enabled in any Wi-Fi 6 routers. Word is that WPA3 support and OFDMA will be turned on in a future firmware update. Other features include support for dynamic QoS, smart connect band steering, DFS and 160 MHz channel support and some configuration via Amazon Alexa and Google Assistant. The RAX200 can be pre-ordered now from Amazon for $599.99, for delivery on June 19. 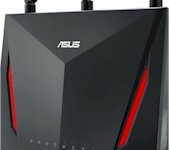 Or you can get ASUS' ROG Rapture GT-AX1100 today for $450. avtella, sd70mac and CrystalLattice like this. No. That's for the RAX80. Different router that has been out awhile. We're well on our way to the 999$ barrier now... Holy crap. Makaveli, avtella and sd70mac like this. I don't understand NETGEAR's logic setting a $600 price point when ASUS is at $450 for the same product. rk8531, Makaveli, L&LD and 2 others like this. Tim, they're pushing to see what sticks. They could always go lower, but they couldn't go higher if they introduced it as such. The power of the Netgear 'name' is mostly limited to their switches for me. Their routers were once great, but they proved themselves incapable of keeping them current and up-to-date, security-wise, over the actual life of the product and not their (greedy?) internal decision(s). For $600 why can't they just give it 10, 10GbE ports, or do other arrangements, e.g., a model with 6 10GbE ports and 1 connector that will support a 40 gigabit QSFP+transceiver? For the premium priced routers, we should not be seeing Ethernet ports that top out at 1 gigabit, the year 1999 ended 20 years ago, but router makers are still using tech from 1999 without really improving it beyond improving the range. No other data connection commonly used today has gone that long without seeing significant improvements at all price levels. while there at it why cant they implement a cpu that can handle gigabit connections with out hardware acceleration software. rk8531 and L&LD like this. 10G ports on routers aimed at consumers don't make sense. Many consumers don't even use the Ethernet ports on routers and fewer have 10G capable gear. Sure they are and I'm not arguing that point. It just that the relative number of potential buyers that benefit from 10G doesn't justify the lower profit from including it. Same platform of the GT-AX11000? I’ve been reading up on the Netgear RAX80 and RAX120. Based on the info from the product datasheets, the Netgear website, anandtech (source: Netgear, but could be wrong of course), etc here is what I’ve come up with. It seems the Qualcomm-based RAX120 is actually using the IPQ8078 (2.2 GHz CPU) not the IPQ8074 (2.0 GHz CPU). More specifically the IPQ8078 has a quad-core Cortex A53 cluster that runs at 2.2 GHz with an additional 1.7 GHz dual-core network accelerator just for deep packet inspection duties. The IPQ8074 has a quad-core 2.0 GHz CPU supplemented by a 1.5 GHz dual-core CPU. I’ve also read that the BCM49408 has a dedicated security processor to enable hardware VPN acceleration. As well as, that it uses Broadcom’s Runner network packet processor, which can handle more than 5 Gbps of system data throughput, freeing up the CPU for other tasks. I know the Broadcom WiFi chipsets also have their own dedicated CPUs as to not tax the main CPU. Im wondering what WAN to LAN speeds the RAX80/200 can achieve with QoS, etc turned on? Internal photos from the FCC show an IPQ8074 in the RAX120 and a BCM4908 in the RAX80. You may have found early information that was based on guesses that were made with the limited, and sometimes incorrect information that was released early. Yes, Netgear is claiming 2.2 GHz quad-core in the RAX120 but Qualcomm says that the IPQ8074 operates at 2 GHz. It's possible that the part Netgear is using has a higher clock but it is not uncommon for published specs to be wrong and Qualcomm is the authority on the specs for their parts. Chipset manufacturers are keeping real, useful details about their chips private so there's not much information that we can draw out of clock speeds and core counts. The pricing is ridiculous nowadays, and there is not even clients out there that supporting this yeat. The question is if ppl even need this at home when you can get fiber this days, I my self are tired of this WIFI hysteria thas going on. Pricing is ridiculous, but my RT-AC3100 is woefully inadequate to provide me Gbps speeds that my ISP gives when a few features are turned on. The case for clients that support (or not) the new features isn't a concern for me. I just care what it may offer my existing ones. I don't buy things for what may transpire in the future. The here and now is the bigger concern. If the hardware is capable of Gbps service with all the features turned on, then the price is (almost) secondary to me. But that hardware is expected to perform obviously better than what I have now. I’ve also read that the BCM49408 has a dedicated security processor to enable hardware VPN acceleration. Correct, it has a crypto device which can accelerate IPSEC traffic. Don't know if that device is included in Netgear's router however (if someone has SSH access to it, check if the bcmspu kernel module is present). It's mostly unusable for OpenVPN however, due to the context switches involved (I benchmarked with and without it on an Asus router). But the CPU itself supports AES acceleration, which does benefit OpenVPN. not even clients out there that supporting this yeat. Samsung's S10 has 802.11ax support I believe. Intel's own card should be out in the coming weeks I suspect, a couple of months at most.